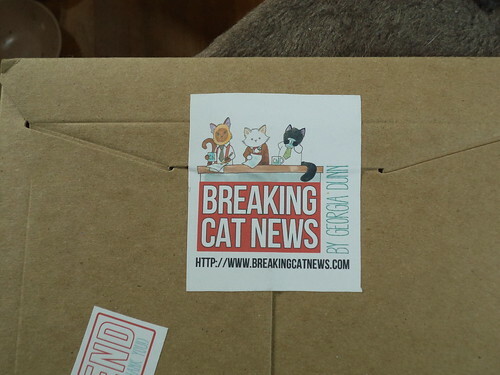 I hope you can stand another promo for Breaking Cat News. I just adore the drawing style and the humor of the comic. The artist, Georgia Dunn, also has an Etsy shop. It's not open all the time, but when it is, I am frantically pounding on the virtual doors, money held tightly in my grip, wanting something she's offering. I ran out of Christmas cards and ordered more the day before she offered cards in her shop. I have cards, exquisitely funny cards, ready for this Christmas. 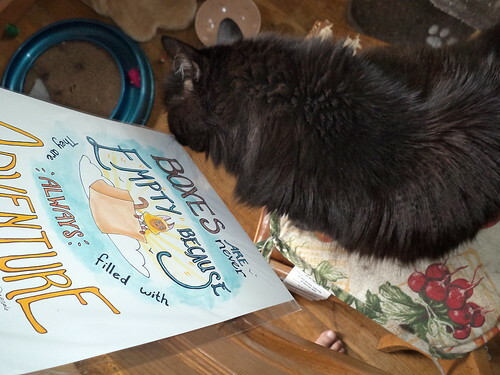 Anyway, back in June, right after I'd received my book, she opened her shop for a week to sell prints. She'd done this picture in one of her comics of Puck scaling a pile of laundry and people clamored for her to make it into a print. The life of a cartoonist, particularly while raising two young children AND, at that time, moving from Rhode Island to California, was daunting. 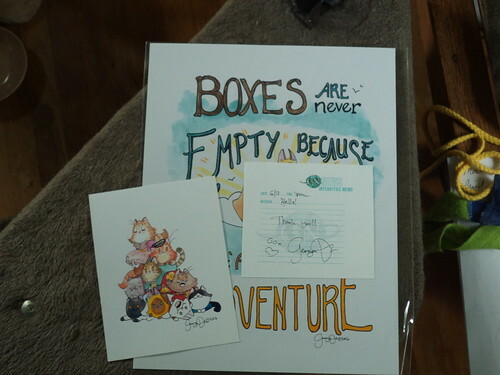 But, the cartoon funds their stability so she opened the shop with a few items; prints, posters, mugs, note cards. Some things were in limited quantity. Of course I was at the virtual doors on the day they were unlocked. While the Puck climbing the laundry print is cute, my kids don't care about the laundry other than sheets and then only because Pilchard has discovered she can pee on them to register displeasure that the litter boxes may not be to her specifications. Hamlet is enamored with the laundry chute because he can go down it, go sideways, and wind up on top of the furnace where there is all the warms. There was another print, however, which caught my eye. One was left in the shop so I snatched it up posthaste. I don't remember how long I had to wait for it to come. Georgia and "the man" personally package every sale and, if you write a note next to the item you're buying, she will respond, if she's not overwhelmed with how many people are throwing money at her. I came home from work one day and there was a sturdy, brown envelope between the door and the storm door. I looked at it and noticed I'm not the only one who likes stickers. Mine, however, aren't custom. That's Tommy, by the way. He does video editing for BCN. I "met" him, I think 2 Christmases ago when, I think it was Elvis, accidentally got out and got lost. Tommy is something of a neighborhood cat, although he has a home. (See? See? These cats are completely relatable.) I was giddy with excitement. My print had arrived! I turned over the package to open it up. Now THAT'S a sticker. Elvis, Lupin and Puck. 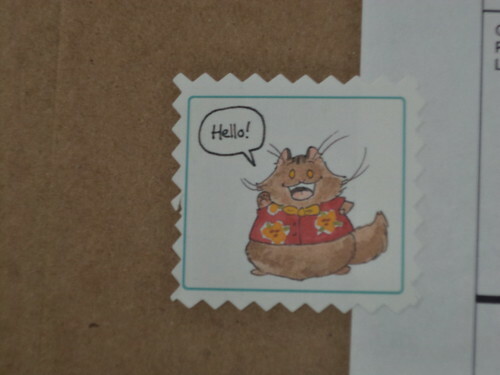 I couldn't open the mailer without tearing the sticker, which made me a bit sad, but inside was my print. This is my house; completely and totally, my house. 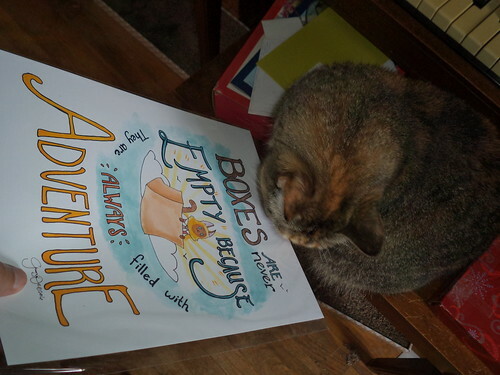 While it's usually Pilchard who jumps or attempts to jump, into empty boxes; Mija also like the bigger ones. Hamlet isn't quite sure. This print taps into two things. #1 - If you have cats, bags or boxes are immediate toys or houses. Any cat lover will tell you of the time they ordered some wonderful toys, cat house, scratching pads, whatever and the cat didn't care about the ordered stuff. All they wanted was the box. #2 - When I was a kid, my dad would bring home large boxes from friends who were getting appliances or from the grocery store. He would cut doors in them; essentially a side flap; and they became cars, trucks, trains, busses. I have such wonderful memories of the excitement I felt when we got a new box. We would play with it until it fell apart. This statement is completely true. Even toddlers will eschew the contents of a box to play with the box itself. Imagination is a wonderful thing. The print came with a personal 'thank you'. There was also a smaller card with the gang. My memory for all the cat names isn't good, but there's Sophia, who lives with Tommy and on whom he has a crush, but she's not all that interested in him; Baba Mouse, who had a great story line last year involving an owl (I will not give it away, except to say Edward Lear would have been proud. Now go to the comic or her web site and find it. ); and the two anchors of the Spanish language cat news network who live upstairs in the house where the boys live. I was so happy. 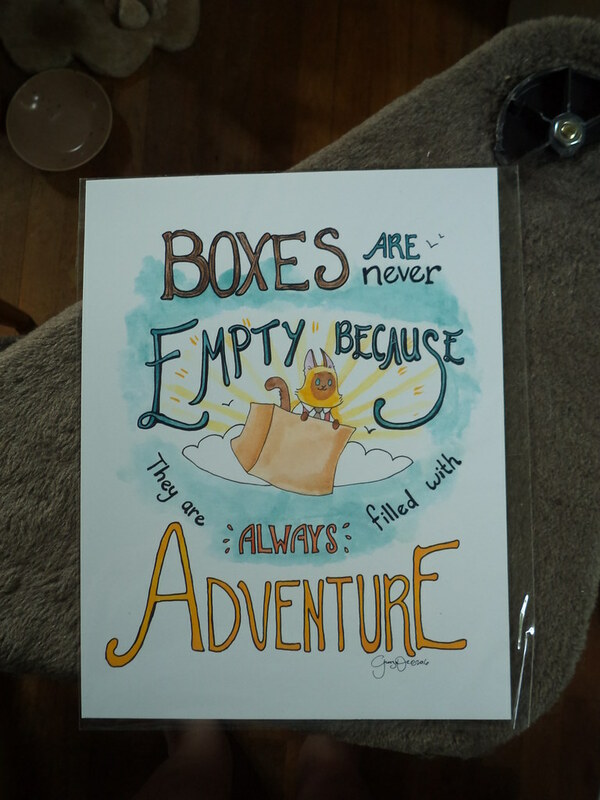 I showed the girls what I'd received since they know that boxes and bags make me excited. Mija sniffed and wandered away. Pilchard sniffed it and rubbed her cheek against it. I'm taking that as tactic approval of this being in the house. I haven't framed it yet. It's 11 x 17 so it needs a decent bit of wall space. I still have an 8x10 of my daughter and son-in-law's wedding that needs framing. I have some art I'm not enamored with any more, which I keep meaning to take down, but the photo and this print won't fit in the vacated spot. I would need to redo the whole wall. That means taking down everything, pulling the nails, patching the holes and repainting the wall. I'm not up to all that. Where I'd like this is in the living room and that's custom paint. If I repaint one wall, I'll have to redo all the walls because the paint has, I'm sure, faded since it was initially painted. So this sits with the daughter's photo. But I have it and it fills me with happiness when I look at it. That's what art should do; make you happy you have it.